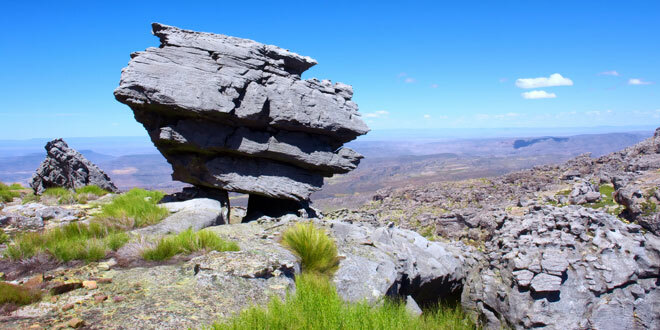 The greater region of the Cederberg comprises the mountains as well as the many nature reserves, and is located close to the little town of Clanwilliam in the Olifants River Valley. The many caves that are etched into the rock faces are particularly significant for the magnificent San art that can be seen on their walls; remnants of the hunter-gatherers that once occupied this tough terrain. When the European settlers arrived, they caused a significant amount of damage to the ecosystem as they established farmlands where there was once indigenous vegetation, and chopped down woodlands to use the wood for furniture and homes. They also ousted the local San folk. Today, however, the Cederberg is a beautiful escape from the fast pace of city living. The countryside is rocky and sparse, but laden with exquisite fynbos in places, which is endemic to this part of South Africa. It is home to a wide variety of animal species; including the leopard, caracal, gemsbok, bontebok, chacma baboon and the vulnerable Cape mountain zebra. Internationally, the Cederberg may have been top secret were it not for rooibos (or red bush) tea, which has put it on the global map for the export of this incredibly healthy and delicious brew. Buchu is also cultivated here. This plant, which can also be consumed as a tea, has been proven to have many health benefits, and is loved by many for its distinctive bitterness. The Cederberg just begs to be explored on foot. There are a number of walking and hiking trails through the mountains and along the rivers. The views are magnificent and there are plenty of opportunities for photographers to indulge themselves. Unique rock formations, charming farmlands, bustling bird life, intriguing caves, and much more await eager adventurers. Clanwilliam is at the foot of the mountains of the Cederberg and is famous for being one of South Africa’s oldest towns (having been established at the very start of the 19th century). Here, the old jail building, an original 1820’s home, the Cederberg Wine Cellar, and the many shops that sell the locally-made leather shoes are musts for any Cederberg itinerary.